The deceased, Gert Jordaan (left), sits with Vernon Barnard (right), who only got away with injuries, on the side of the Bluff Road where the accident occurred PHOTO: Southlands Sun. The two homeless men were a topic of discussion on local Facebook groups earlier this year. 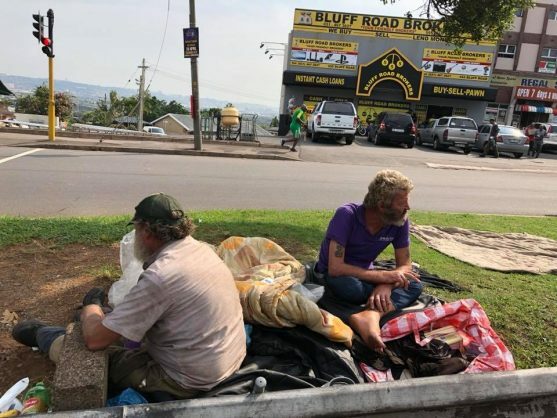 Two homeless men on the Bluff who were sleeping on the verge on the corner of Bluff and Old Mission roads were mowed down by a bus this morning (Wednesday, 30 May). Garrith Jamieson from Rescue Care Paramedics confirmed one of the men had died at the scene, the Southlands Sun reports. It is unclear what caused the bus to veer into the men. Police will investigate the cause of the fatal crash. The two homeless men were a topic of discussion on local Facebook groups earlier this year. A photo of the two was posted, with residents expressing concern about their presence being an eyesore to those who pass them daily. Resident Lynn Botha, who drove past the accident site, said it had just happened when she drove by, as there were no ambulances at the scene. “It’s sad what happened and I hope all those people who complained about them being an eyesore are eating their words,” she said. Councillor JP Prinsloo said several attempts had been made to re-home and rehabilitate the men, but they had refused to move. “They usually sat under the tree in the centre median. They had been there for a year and we had warned them of the dangers of sitting there. It is sad that this had to happen. I will write to the city manager, head of transport and Metro Police about this as there are no concrete plans on how to deal with vagrants. This cannot and should not happen again,” he said.